Notes: Title from data provided by the Bain News Service on the negative. 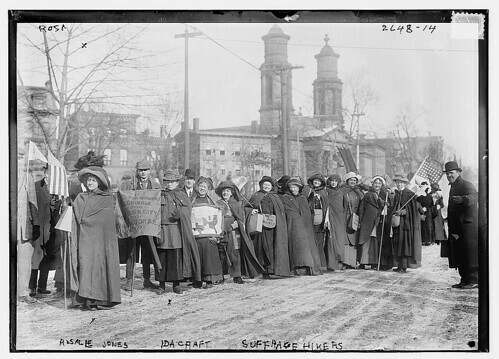 Photo shows the hike lead by "General" Rosalie Jones from New York to Washington, D.C. for the March 3, 1913 National American Woman Suffrage Association parade. (Source: Flickr Commons Project, 2009) Forms part of: George Grantham Bain Collection (Library of Congress). Serena, that is one fabulous photo! Almost a hundred years ago. Wow! GOOD on them, absolutely. I've read a few of the suffragette's stories, and the way they were brutalized... I just have to wonder. Oh man, the suffragettes suffered unmercifully for their belief's and cause, yet still they did it. They were some strong women! They were strong, and have my undying admiration.